Beautifully set off the beaten track, in open countryside and near woods, you often see birds of prey and other wildlife as you cross the stream en route to La Panetterie. This traditional Correzienne barn, converted to a high standard of accommodation for up to 6 people + baby, is tranquilly situated approximately 5 mins drive from the village of Lubersac. Accommodation at La Panetterie is spacious and classically furnished on one level, which makes it ideal for the elderly. For the more active guest, there are 4 adult and 2 childrens’ mountain bikes, a table tennis table and pool table available in the adjoining stables to the cottage. Lubersac offers good amenities, an impressive chateau, a few good to excellent restaurants (notably Chateau La Fragne) and an open air swimming pool (with lifeguard). Enjoy a tranquil retreat or make the house a perfect family base to discover enchanting medieval castles, picturesque villages, lakeside beaches and waterfalls in unspoilt Correze. It is unspoilt, furnished to a high standard, misses no vital comforts, has lots of space, very few neighbours and is yet close to the well-stocked town of Lubersac, is surrounded by beautiful countryside and lots of interesting places to visit. An impressive living room of large dimensions, wooden beams and a fireplace over 8m long. Satellite TV/DVD and portable CD player/digital radio are available. An open-plan, good sized and well equipped kitchen with French doors that open onto a barbecue area, large back garden and views of the surrounding countryside. You can enjoy informal eating here. Accommodation at La Panetterie is spacious (120m2) and classically furnished on one level. As you enter the house you find a large beamed living room and open plan kitchen. Just off the kitchen is a utility room that contains a shower, toilet and washing machine/dryer. There are three double bedrooms (1 Queen, 1 double, 1 twin + travel cot for child of up to 2 years). All rooms have attractive views. There is also a large family bathroom with bath, shower attachment, and toilet. Dining is available in the sunlit formal dinning room with French doors opening onto the front garden. Adjoining this room are the stables of 120m2. They house a pool table, full-size table tennis table and 6 mountain bikes for your use. The three of us spent 10 wonderful days here.We used La Panetterie as a base to explore the surrounding countryside with it's many pretty villages and towns. If you want to find out more about the area there is a blue folder full of things to see and do provided by the owner in the living room.We found everything we needed in the cottage, which is very well equipped,but just be aware that the oven has an automatic lock on the door which prevents you from opening it until the temperature drops, this is indicated by a small red padlock light which goes out when you can open it.The local village of Lubersac has a good selection of small shops as well as Super u and Lidl supermarkets.We met Sonia the caretaker and Keith,originally from Doncaster, who came in and cut the grass.We have to thank Sonia for recommending the town of Brantome,what a lovely place, and the 50 minute boat trip up and down the river is a must.If you need to know about the pros and cons of living in France either Keith or Sonia can fill you in. We live in a very small village in rural Norfolk and are used to a pretty quiet life,but we were amazed at the stillness and complete lack of any noise when we stood outside in the late evening,as they say "The silence was deafening" and the absence of any light pollution meant we were treated to a fantastic star filled sky. We spent a fantastic week at La Panetterie. We spent a fantastic week at La Panetterie. 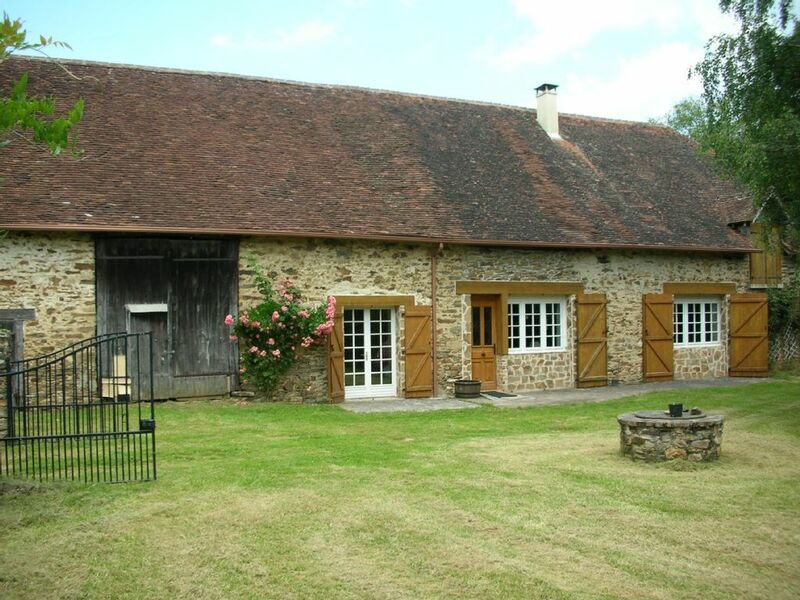 It is a very well equipped gite and caters for all ages. We were a family of 7 from ages 7 to 82yrs. Have stayed in several places in different countries and this is by far the best we have stayed in. There sare so many places to visit and there is a great pool with slides 10 mins away. Thank you Pandora and will be returning in the near future. The Limousin region of France is recognised for its rolling green landscapes, interesting medieval history, beautiful lakes and thriving market life. Recommended places for you to visit from Lubersac include •Arnac-Pompadour - home to the National Horse Stud of France, a 15th century chateau built for Mme Pompadour by King Louis XV and an impressive horse racing track viewable from street level; •3 medieval, award winning “Prettiest villages in France”: Segur le Chateau, St. Robert and Collonges Les Rouges. They feature cobbled streets and breath-taking riverside scenery. •Gimel-les-cascades – a hillside village from which you can take walks past fast-flowing waterfalls (largest tumbles 45m) •Brive La Gaillarde and Limoges, your nearest large towns for shopping, nightlife and a café culture, all in a medieval setting •and Lake Vassiviere – famous for its safe beaches and water sports Other popular activities include pool and lake swimming, canoeing, fishing & horse riding.